Our final walk took place at Little Pix Hall Farm in Kent, which is managed by this year’s third place winner in the competition, Will Steel. Will has transformed the farm into a business where soil management takes priority and is sustained for the long term. 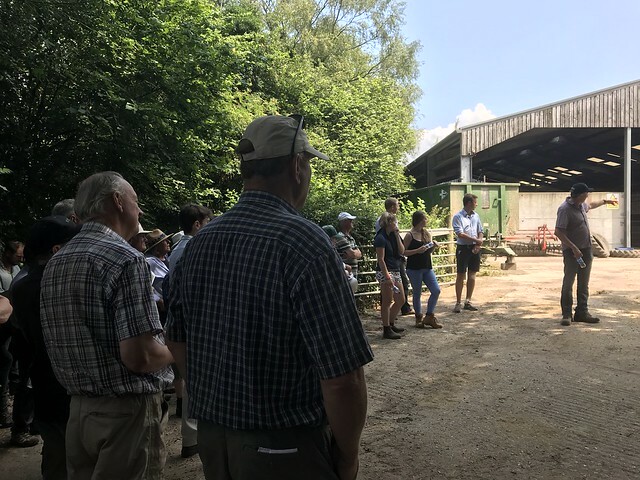 The focus of this farm walk was looking at how farming and the environment work together to create resilience, and looked at how to make the most of the assets on the farm. Will explained how getting the soils to work and be more productive was a crucial part of the long term strategy of the business. The farms soils were tested when it was derelict in 1987 and had a soil organic matter percentage of 5%. This dropped to 2% in the 1990s using a plough based system, and Will has been working since 2000 to increase the organic matter percentage back up to 5% using a combination of minimum tillage, no till and cover crops. Click on the image to see the photos of the walk. Will explained how cover crops are a key part of helping build soil health and fertility. The field had previously been down to a second wheat, with a cover crop planted immediately after the combine with an 8 way mix to maintain green cover. The aim of the cover crop is to grow fertility – it avoids the expense (and paperwork) of importing manure and the risk of compacting the soil when the manure is spread. Will terminates the crop by rolling on a frost when the temperature is minus 5 and is getting good results using this method. As with all of the farm walks, how the crops were performing in the dry weather was a hot topic of conversation, and the importance of organic matter in terms of holding onto the moisture was well recognised. Will also recognises the importance of worms (as all of our finalists do) and through regular worm counts is seeing the numbers rise from 12 million per hectare two years ago to 15.3 million per hectare this year. He puts the increase down to the improved organic matter levels and the management of residues as well as a reduction in tillage. Massive thanks to Will for hosting a very informative walk!